Christian City, Inc. created this Privacy Statement to demonstrate respect for your privacy preferences and to disclose our information collection and sharing practices. Regardless of whether you provide us with your personal information via our website or in another manner (e.g. telephone, regular mail or face-to-face), we strive to honor your privacy preferences. BY ACCESSING AND/OR USING THE WEBSITE, YOU HAVE AGREED TO: 1) abide by the practices described in this Privacy Statement, as may be amended from time to time, and 2) the transfer, processing, and maintenance of your personal and sensitive information in the United States of America. THE PERSONAL INFORMATION WE COLLECT: Depending on the type of communication or transaction, the personal information we collect may include but is not limited to, your name, postal address, zip code, telephone number, organization name, e-mail address, credit card, bank information or billing information. 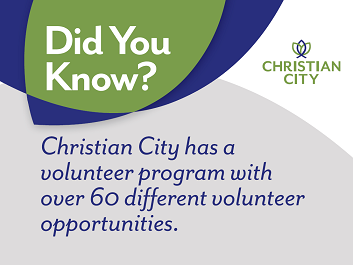 WHERE AND WHEN WE COLLECT PERSONAL INFORMATION: You will be asked to provide your personal information when making donations, applying for various Volunteer and Child Sponsorship opportunities, requesting communications, applying for a job with Christian City and/or in connection with other Christian City business (whether it is via the website, e-mail, direct mail or telephone communications). WE DO NOT KNOWINGLY COLLECT INFORMATION FROM CHILDREN: We do not knowingly collect or solicit personal information from anyone under the age of 18 or knowingly allow such persons to provide us with their personal information. If you are under 18, do not send any information about yourself to us, including your name, address, telephone number, or e-mail address. In the event we learn that we collected personal information from anyone under the age of 18, we will delete that information as quickly as possible. If you believe that we might have any information from or about anyone under the age of 18, please contact us at ccity@christiancity.org or call us Monday through Friday, 8:30 a.m.-5:00 p.m. Eastern Time at (770) 703-2636. INFORMATION SECURITY: Christian City has a layered security in our systems and only designated employees have access to hard copies of your personal information. All on-line transactions are done on a secure server. This means that information entered on the transaction page is encrypted using SSL (Secure Socket Layer) before transmission. On secure pages, a “closed” lock symbol is displayed in the bottom part of your browser screen and the website address in the address bar at the top of the browser screen starts with an “https” instead of an “http”. Donation pages are verified by Authorize.net and transactions are secured using a VeriSign merchant account. CHRISTIAN CITY MAY SHARE YOUR PERSONAL INFORMATION: Personal information will be shared internally at Christian City to complete your donations or purchasing transactions, to contact you about our on-going work, discuss employment opportunities and ways that you can further support our efforts to help those in need. Your personal information will also be used to provide you access to the various sections of our website that have been personalized for your needs. Christian City may share, rent or exchange donor names and postal address with third parties. Except in the limited circumstances outlined below, Christian City will never intentionally share your e-mail addresses, phone numbers or financial information. 1. Credit Card Transactions, Electronic Fund Transfers, Payments by Check or Money Order and On-line Transactions. Christian City hires third parties to provide credit card, bank, payment and information processing services and order fulfillment services. If you choose to make an application for employment, make a donation on-line, by phone, through the mail or by other means, we will share your personal information with our processing service providers. We make an effort to require all third-party service providers to hold personal information in strict confidence. While we believe these other companies are upstanding and will treat your personal information responsibly, we do not own or control them and cannot guarantee your privacy. 2. Necessity. If we have reason to believe that there has been some inappropriate interference with or use of our website, communications, charitable services or personal or real property or have reason to believe that one of the Christian City website users, donors, employees or other related parties may have been injured or may have harmed some other party, we will disclose, without notice to you, personal information as we deem appropriate or if compelled by a legal or regulatory authority. YOU MAY ALWAYS CHANGE YOUR PRIVACY PREFERENCES BY CONTACTING US: If you would like to change your privacy preferences, please e-mail us at ccity@christiancity.org; or call us Monday through Friday, 8:30 a.m.-5:00 p.m. Eastern Time at (770) 703-2636. COOKIES AND PIXELS: A “cookie” is a small piece of data that is sent to your browser from Christian City’s web server and is stored on your computer’s hard drive. Cookies are used to collect non-identifying information about the user, such as Web surfing behavior or user preferences for a specific website. Christian City uses two different types of cookies – session-based and persistent cookies. Session-based cookies expire at the end of a browser session so once you close your browser the cookie simply terminates. Persistent cookies remain on your computer until you remove them. Persistent cookies are used to provide internal Website analytics. You can manually delete all cookies including persistent ones within your browser privacy. In addition, Christian City uses “pixels,” or transparent GIF files, to help manage online advertising. These pixels do not collect identifying information. WEBSITE LINKS: In order to provide certain services and goods at our website, we contract with other companies and individuals. These additional services and goods may include “links” to other websites from our website. Christian City’s privacy practices may not be applicable at any third-party sites. Anytime you leave the Christian City website, we have no control regarding what information may be collected about you, nor do we control what third-parties might do with the information. It is important that you review any privacy policies on third-party sites carefully BEFORE you use any services or programs offered. CHANGES TO PRIVACY PRACTICES: From time to time, Christian City may revise its privacy practices to address changing technology, security measures, and website functionality. We strive to provide you with timely notice of these changes. Please contact us if you have any questions about changes to our practices. CONTACTING CHRISTIAN CITY ABOUT PRIVACY PREFERENCES: If you wish to change your privacy preferences or have any questions please contact us. TELEPHONE: Monday through Friday, 8:30 a.m.-5:00 p.m. Eastern Time at (770) 703-2636.